Dr. Bruce Michelson is the Director Emeritus for the Campus Honors Program, and Professor Emeritus of English at the University of Illinois at Urbana-Champaign. His publication topics include books on Mark Twain, Claude Monet, Literary Wit, and the poet Richard Wilbur. 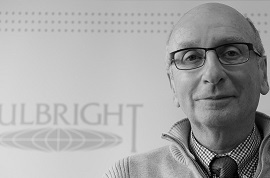 Dr. Michelson is a past President of the Mark Twain Circle of America and the American Humor Studies Association, and a Fulbright Professor of American Studies at the University of Antwerp in 2014. As a Distinguished Teacher and Scholar at the University of Illinois, Bruce has authored over 40 articles and book chapters, 3 book-length Instructor Guides for the Norton Anthology of American Literature, lectures and keynote addresses across the US and in 6 other nations. Additionally, he has been an on-screen commentator for two episodes of American Passages (Annenberg/Oregon Public Broadcasting). Some of his current projects include work on Mark Twain, Past and Present, and a translation of work by Clemenceau.